Does John Tory Still Matter? Everyone's waiting to find out if he'll run for mayor. But would it make a difference if he did? 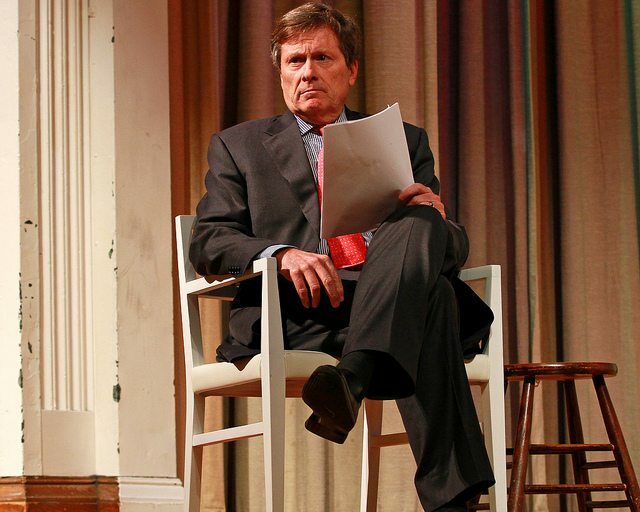 John Tory moderating a by-election debate in November, 2013. Photo by Joseph Morris from the Torontoist Flickr Pool. Given the many difficult dilemmas he has faced in his so-far notoriously unsuccessful political career, especially the current troubling question—Should he run for mayor?—it’s hard not to sympathize with John Tory. But let’s make the effort anyway. The guy is getting stale. Yes, that’s terribly unfair. Tory is the epitome of a decent guy, Upper Canadian–style, whose candidacy would elevate the tone of the campaign and warm the hearts of enthusiastic supporters across the city. But there’s a good chance that by the time he finally decides whether or not to run—sometime in February, he has promised—the answer won’t much matter, one way or the other. Familiar vultures are circling his career while rivals scamper ahead. Yes, it’s unfair to criticize Tory’s indecision without knocking Olivia Chow for the same coyness about her own intentions. The difference is that everybody knows Chow, bar disaster, is going to run. By contrast, Tory gives every indication of being legitimately undecided. Look up “John Tory Mayor”: you needn’t even open any articles to see phrases like “non-decision decision” and “chronic indecision is his Achilles Heel” in the search results. The reason Tory can’t decide this time around is obvious: no matter how hard you crunch his invariably positive approval ratings, they never add up to victory next fall. Rob Ford is a rock, Chow’s a hard place, David Soknacki a fresh new alternative, and Karen Stintz a mocking chorus. How well we remember Rick Johnson, erstwhile king of Coboconk, who won precisely two years on the back benches of the Ontario legislature due to his inestimable good fortune to have been facing Progressive Conservative Party leader Tory in a 2009 by-election up there. Citing “close confidants”—perhaps the same ones who insisted Tory was going to run for mayor in 2010, the last time we all watched this fan dance—the Star writes that he has already decided to run this year. More recently, one of his friends told me Tory has definitely decided not to run. The most reasonable speculation is that Tory won’t know the answer himself before he is finally forced to give one, and it may well be determined by some minor event that is yet to happen but will finally topple his massive pile of mental pros and cons in one direction or the other. The worst case scenario for Tory, which is not at all unlikely, is that he finishes third, behind Ford. That would be an unbearable humiliation for him. It’s no wonder he hesitates. The phrase that pushes itself forward at the stage of the game is “yesterday’s man.” From his apprenticeship under Bill Davis to his very name and the former colour of his hair—red—Tory is the consummate personification of a vanished political tradition, one that has been forcefully suppressed by its own party. The Red Tories that Mike Harris failed to finish off, Stephen Harper took care of. And although obscure Rick Johnson may have gotten the credit for ending Tory’s career as leader of the Ontario Progressive Conservatives, hard-right elements in his own party helped at every step of the way, up to the point of distributing anonymous anti-Tory leaflets in the campaign. Now those “elements” are open and ascendant in Toronto, where right-wing politics under Ford has become markedly anti-establishment. The very thing that might once have won votes for an establishment figure like Tory is again threatening to undo him. Throughout his intermittent career in municipal politics, Tory has worked hard to show himself to be a caring person willing to reach out to less fortunate Torontonians, hear their grievances, and do what he can to help. The reach is long, but the effort is genuine. Meanwhile, Rob Ford smokes up with them. No reach is necessary, and all the advantage is his. Ford is a sinner: the ultimate credential for a true man of the people. Tory is spotless—and therefore, according to the same logic, he must be fake. Yes, it’s unfair. Left-wing complaints that Ford was “born rich” have done nothing to prevent the hoi polloi from identifying with him. And all that outreach has done nothing to alter Tory’s image as the smooth-talking tribune of a distant establishment. The people aren’t stupid. Tory’s attitude of noblesse oblige is deeply instilled, unshakeable, and a potentially fatal flaw in Toronto in 2014. I remember Tory telling me at the end of an interview some years ago about how his friends could never understand why he bothered with local politics, but were nonetheless grateful to him. Their attitude, Tory said, is that “somebody’s got to do it,” adding that he is happy to be that man: the spokesman, in other words, for interests too lofty to bother with the trivial concerns of the unwashed masses. There once was a time when said masses might well have been happy to be so led. But as John Tory’s political career has demonstrated again and again—almost as if it exists to do so—that time has passed.